When Mayor Bill de Blasio threw the first pitch at Citi Field last week, he shrugged off the loud boos. He overcame criticism in January for his inclination to eat pizza with a fork. And, he survived a verbal smackdown over poor snow removal on the Upper East Side -- and added $35 million to the Sanitation Department budget in February. He has had no shortage of criticism in his first 100 days in office -- some consequential, some not. Hizzoner has found himself in the pantheon of newbie mayors who need all the help they can get. And because this is NYC, there are heaps of unsolicited advice -- especially from quintessential New York-only types. Douglas Stone, co-author of the new book "Thanks for the Feedback," says that to keep his sanity, the mayor has to distinguish between legitimate criticism and thinly veiled attacks. "Start with the assumption that it's legitimate feedback and see if you can make sense of it. See if there's anything in it you can learn from. If so, it doesn't matter whether it's also an attack. If there's nothing to learn, then it also doesn't matter whether it was an attack." Sophie B. Hawkins, a Manhattan-born singer and songwriter, urged de Blasio to ignore public opinion in favor of his view of himself. "A strong sense of oneself, one's work, has to be earned by oneself," she said. Easier said than done for public officials whose ears are bent daily by criticism from myriad tough critics. Composer and actor Joe Kinosian, whose musical "Murder for Two" is playing Off-Broadway, initially sang the parts of about a dozen characters nightly. Like the mayor, Kinosian had to assume different personas while managing expectations. "Just do your thing, and hope that an audience finds you," he said. De Blasio may be making some inroads -- 49 percent now approve of him in a poll this week. And psychic reader Dante Sabatino, who read tarot cards about the mayor, said things look good for him. "What he says -- he does," he said. That may further infuriate those irate about the mayor's proposed ban on horse-drawn carriages, and give Gov. 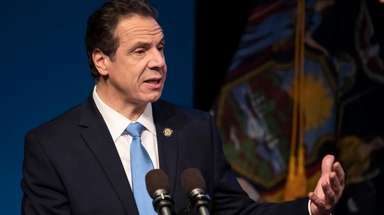 Andrew Cuomo heartburn over de Blasio's potential push for a tax increase on wealthy residents. Rachel Weingarten is the author of the forthcoming book "Ancient Prayer: Channeling Your Faith 365 Days of the Year." Rachel Weingarten frequently writes about consumer trends, the cult of celebrity and the intersection of personality, art and commerce. Rachel is the author of three non-fiction books. Her new book, Ancient Prayer: Channeling Your Faith 365 Days of the Year, will be published by Fall River Press in September 2014. She's a weekly columnist for Parade.com and writes for outlets including CNN Digital, Esquire.com, Fortune, Newsday, USA Today and others. Rachel was an early internet entrepreneur, former celebrity makeup artist and founded the first low-fat mini muffin company approved by the FDA. She created, wrote and acted as the on-air talent for a series about women entrepreneurs that aired on CNN. Rachel is a sought after speaker and can sometimes be found leading personal branding seminars at NYU or teaching about the history of cosmetic and fragrance marketing at FIT, both on the graduate level. Rachel is a native of Brooklyn currently working on her fiction debut, the “Real Brooklyn Girl,” mystery series.